Ultimate Edition for $100, includes the game, Car Pass (6 months x 7 cars each month), Motorsport All-Stars Car Pack (10 more cars), and VIP (5 more cars and other perks). Oh, and you can also start playing on Sep 23rd, but only with this bundle. I'm tempted to go for that Ultimate bundle, given how much I enjoyed FH2. I'll have to think about it. 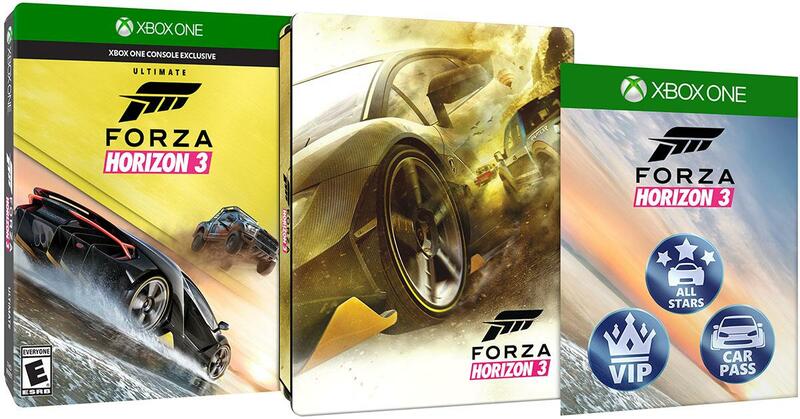 Re: Forza Horizon 3 (XboxOne/W10, play anywhere) - Sep 27, 2016, mate! I'll get the game for sure, but will pass on the bundle. The DLC packs/Season Passes always go on sale after several months and there are plenty of cars to fool with in the meantime. Plus this game will almost certainly be part of the Best Buy $10 RZ preorder deal. Combine that with the $48 GCU price and there's no way that buying a $100 package from MS is as good a deal. Good call! I haven't used my RZ membership to pre-order anything yet, but I'll definitely use it for that. If the built-in variety of radio stations doesn't keep you pumped, Horizon 3's Groove Music support surely will. Horizon 3 is the first Forza on Xbox One to allow users to listen to their own music in place of the stock radio stations. Adding your music will be a relatively simple process, too. Put your MP3s into your OneDrive account, make a playlist, and then it will become a radio station in-game via cloud streaming." After spending a couple more hours with FH2 over the weekend, I went ahead and preordered FH3 Ultimate Edition. With the $20 discount at Amazon and another $10 discount ordering through Alexa, brought it to $69 and no tax for me. The 57 extra cars seems like it's worth it and I'm a sucker for a game that comes in a steelbook . Hold up : the Ultimate Edition comes with a Steelbook? That changes everything. The Forza 5 Ultimate Edition is one of my favorite gaming Steelbooks in my collection (the game not so much). That one was $80 and included the VIP but not the Car Pass. This in a Steelbook with all that extra DLC for $100 ($80 after GCU) is a total deal. Sold. Still no word on a $10 RZ Certificate yet so I guess they aren't having one. Weird since they have on the last few Forza games. Either way, I'm in. Edit : I looked and couldn't find confirmation of a Steelbook anywhere but Game Stop's site. It's not mentioned in the Press Release or on the Microsoft Store site. However the cover image at Best Buy and Amazon shows rounded corners that should indicate a Steelbook. Since there doesn't seem to be a $10 RZ certificate with this preorder, went ahead and did the Alexa thing like you. I pay tax, but $75 total for that is still a nice deal -- especially if it is indeed a steelbook. Looking at that picture, I think it has to be. Last edited by Decker; 07-11-16 at 09:41 AM. Forza Horizon 3 Ultimate Edition includes early access to the full game, the Forza Horizon 3 Car Pass, VIP Membership, and the Motorsport All-Stars Car Pack. It is encased in a Steel Book® on retail disc. I kinda like the early access too. It looks like this game and Gears are taking advantage of that so far. I wonder if you get the game early or just a code to use like EA Access. If it's the game early, that's pretty cool. Though it's still not enough to get me to spring for the Gears 4 UE -- $40 more for private access to the free public maps and some cosmetic bonus items? Give me a break! Also speaking of MS promotions, looks like this will be another of those Play of Windows 10 Free games. Don't know if that's only for the Digital version though. Last edited by Decker; 07-11-16 at 11:11 AM. ^ For now, I believe it's just digital purchases that qualify for the "Play Anywhere" thing. Otherwise, they'd have to let you put your XBox One discs in a computer to play the games, and that could be problematic for them, in terms of piracy, at least for now. Okay. I'd never play it on my PC anyways. The paddle shifters on the Elite Controller makes the game so much fun! I used to love playing with the paddle shifters on my Infiniti back in the old days, when I had a car with a transmission. So are physical copies of the limited edition showing up 4 days earlier than the regular release? Sounds like it. I wish more games would come out on Friday instead of Tuesday, since I do most of my gaming on the weekend. CDs come out on Friday now, as do most Nintendo releases. 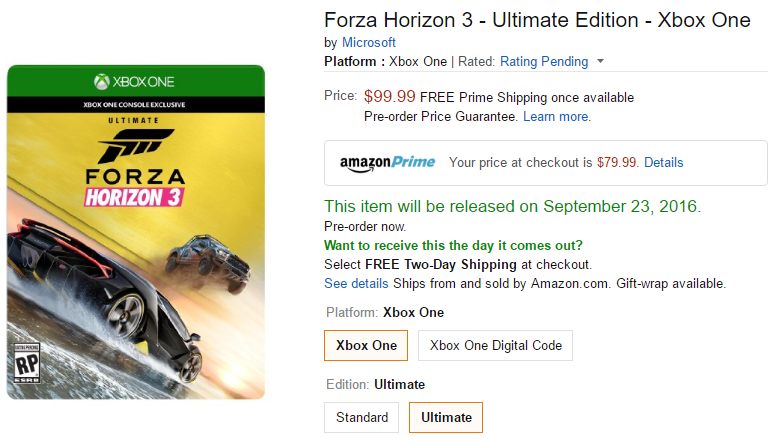 "Forza Horizon 3 - Ultimate Edition - Pre-Load - Xbox One Digital Code"
So it looks like they send out a download code when you Pre-Order the LE and I assume it's only for those first four days. I don't know what the delay means though. Did they push the game back a week or something? "Forza Horizon 3 - Ultimate Edition - Xbox One"
You could only look (but not drive) the Warthog in Forza 4, but in Horizon 3, you can actually jump behind the wheel. No 4-wheel steering, though. Achievements have been announced too, and they're more single player-friendly and surprisingly attainable overall than any of the other Forza games on the XB1. Recommended PC specs are listed at that link as well. From where? Email or Xbox Message notification? I've heard from a bunch of people who've gotten theirs, but no dice for me yet. They do tend to roll these things out kinda slowly and gradually, though. Bburago is the worst diecast manufacturer in the world.